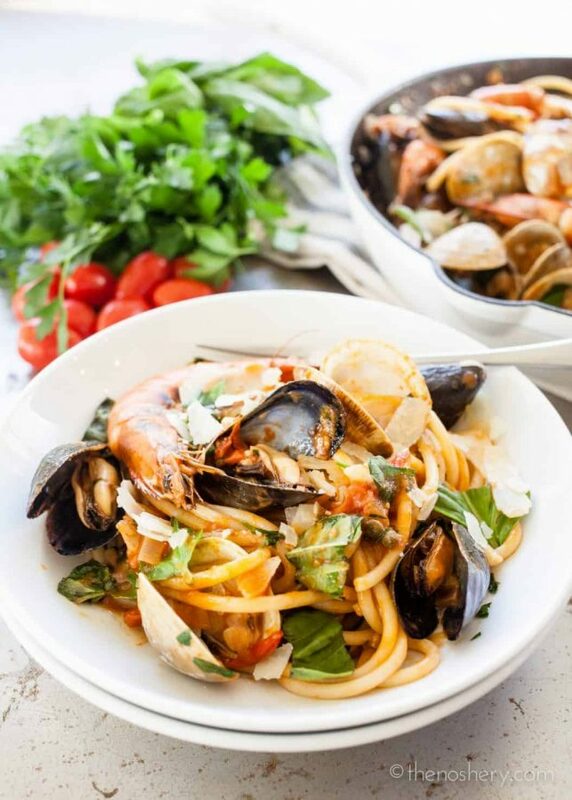 Seafood Pasta (Pasta di Frutti di Mare) | There is a little Italian restaurant nearby that OB and I like to go to on occasion. It’s a small little place, not fancy but I love their food and they are BYOB. So, whenever we go we always have a bottle of wine in tow. Whenever I go to an Italian restaurant I usually go for lasagna or pasta di frutti di mare also know as seafood pasta. I love seafood pasta! 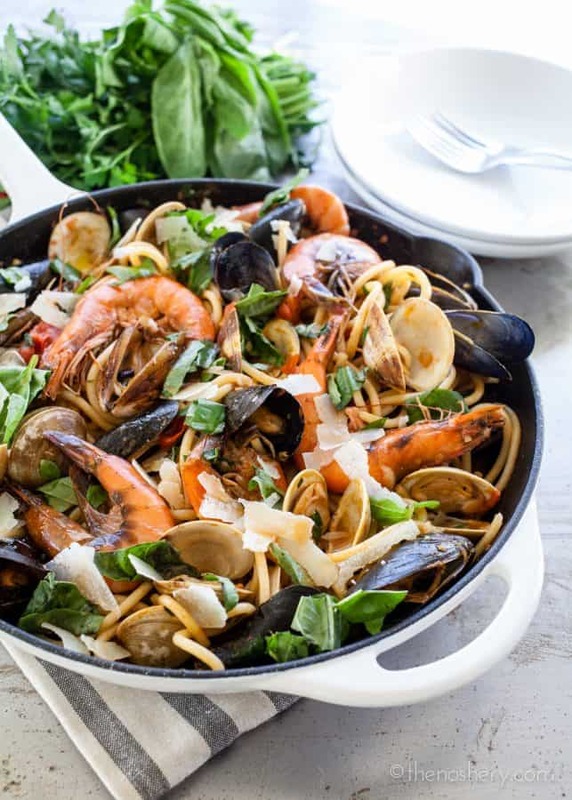 Specifically seafood pasta with shellfish. It’s not a dish you want to eat on a first date. It’s long saucy messy noodles and a lot of man-handling of shellfish. It’s what I like to refer to as an interactive dish. But every once in a while I love to get my hands dirty. I have tried many times to eat seafood pasta like a lady but, it’s not as fun. I enjoy the process of pulling shells apart and sucking the briny sauce from the shell. Half of the fun of eating shellfish is using your hands. Right!? I’m not the only one making a mess of myself? 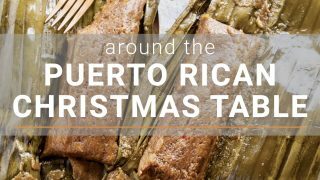 This is one of those dishes that looks beautiful and impressive but is surprisingly easy to prepare. I love to prepare a dish like this for guests. It has an element of the dramatic with a minimal amount of effort for such a result. Your guest will “Oh and Ah” and you’ll be looking as cool as a cucumber. For this dish, I used bucatini pasta which is a long noodle hollow pasta. This is one of my favorite kinds of pasta because it’s a long noodle that holds the sauce. If you can’t find bucatini you can use any long noodle pasta like linguine, fettuccini, spaghetti or pappardelle. 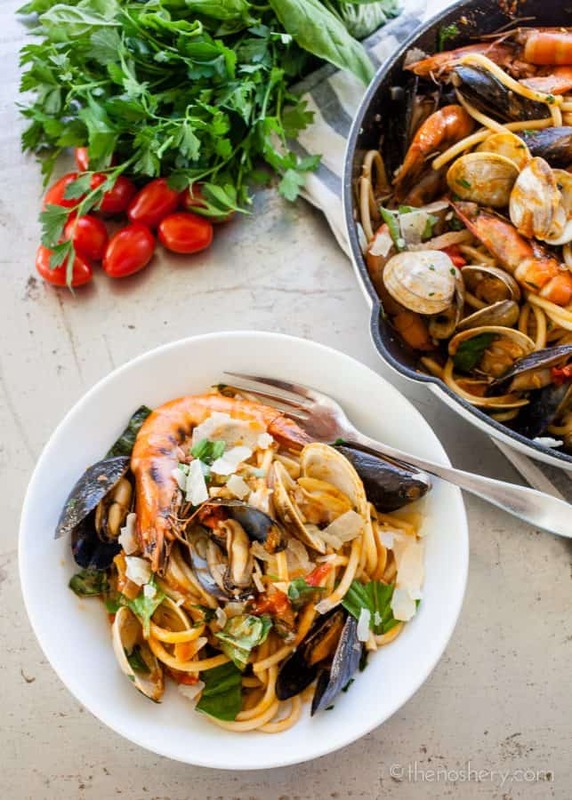 A saucy seafood pasta with tons of flavor and a little spice. I love to use bucatini pasta with this dish. Bucatini pasta is a long noodle pasta that is hollow in the center. The pasta holds the sauce making sure you get a bit with every bite. Prepare pasta according to package directions. Reserve 1 cup of pasta water. Toss pasta with olive oil and set aside. Heat a large heavy bottom deep skillet over medium heat. Melt butter and olive oil to the skillet. Add onions, garlic, and crushed red pepper, saute until tender and fragrant, about 4 minutes, stirring being careful not to allow the garlic to burn. Add wine and simmer until reduced by half, about 3 minutes. Add tomato paste, grape tomatoes, clam juice, and pasta water, stir until well combined. Add clams, muscles, and shrimp, toss with sauce and cover. When the shrimp is pink and curled set them aside. Cook the until clams and muscles open, about 4 minutes, setting them aside as they open. Discard any unopen shells. Once all seafood has cooked bring the remaining sauce to a simmer to thicken if need. Add pasta and parsley to the sauce and toss. 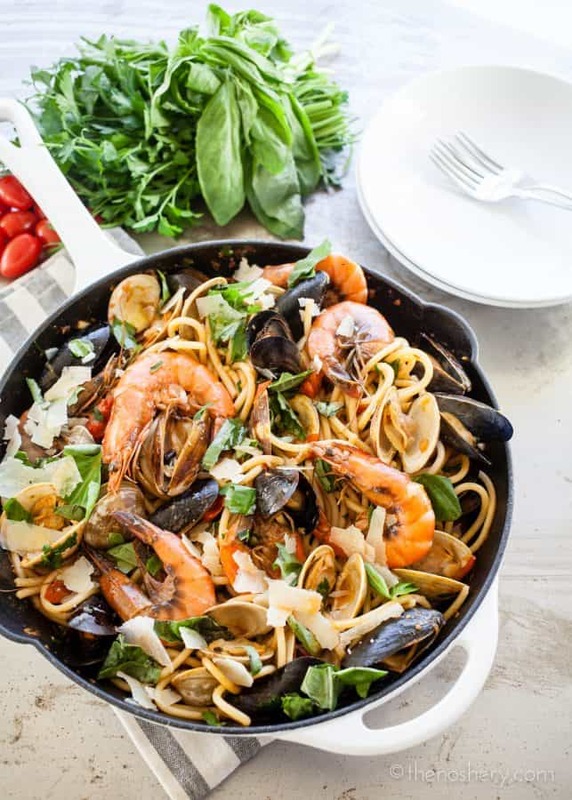 Add seafood to pasta to reheat. Serve pasta garnished with torn basil leaves and shaved pecorino. I chose to use the whole head-on shrimp but you can use cleaned jumbo shrimp. This was DELICIOUS! It tasted just like something from a restaurant but from the comfort of home. I made it twice. Followed your recipe to the T the first time and it was wonderful. Made it again but used a big bag of seafood from Sam’s Club and it was still awesome. The hubby is happy and rubbing his tummy. The only thing I would recommend is a bib lol! I made this, it was good but I did not need a cup of pasta water and really regretted adding it. It watered down what would’ve been a great sauce. I am sorry to hear that, thank you for the note and I will specify that the pasta water is optional if sauce is too thick.